BrainRead courses are offered to businesses world-wide in English and German. Further languages will be added soon, as we grow our network of trainers. 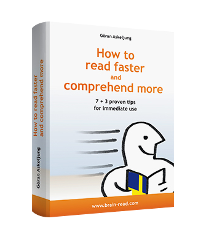 BrainRead® was developed as a speed reading method based on the research about how reading is learned in Scandinavia. Author Göran Askeljung, born and raised in Sweden, has been offering BrainRead courses since 2003. He has helped more than 10.000 people to double or even triple their reading speed and comprehension. Now you can learn the secrets of the BrainRead speed reading methods too, practice for yourself and save valuable time every whilst reading.